Volleyball Resumé: Fourth year playing for the Ottawa Maverick Volleyball Club. Provincial Champions 2018. Set for two years, right side for two years. Played for Region 6 at the Ontario Summer Games 2016. Team Ontario Red 2018. Voted MVP for West Carleton High School volleyball team two years in a row. Assistant Coach for Ottawa Maverick Winter, Summer and March Break camps and clinics.Head Coach, West Carleton Jr Boys Volleyball Team 2019. Favourite Volleyball Moment: Playing for Team Ontario in the Canada Cup 2018. Favourite Quote: I never said it was going to be easy. I said it was going to be worth it. 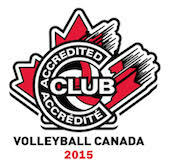 5 Year Plan: Continue playing volleyball with the Ottawa Maverick Volleyball Club and continue playing post secondary.